One dear friend pointed out this morning how hard it is to reconcile the cemetery where she takes her very young child to visit her father's grave with the plastic headstones all over town, the scary way graveyards are depicted, not just at Halloween, but in many children's stories. I've been meaning to write about Halloween. I've been meaning to write about Halloween since October 2009. This is the first year I've seen other posts and articles about how ridiculously hard this holiday is for grieving people, and I'm so glad the word is getting out. All it takes is a few people telling the truth about their experience, and that opens the gates for others to speak up, too. If cemeteries are terrifying places, how can they also be the place they go to visit her father? Others have talked of neighborhood yards full of hangings, of throats slit, of hands rising up out of vats of water. How horrifying this all is, when you have lived these things. When this is not seasonal ephemera, but a scene stitched into your heart and mind, a scene you have lived, for real. The first Halloween season after my fiance drowned, I eyed the neighborhood decorations with deep, deep scorn. I was horrified at the surface death imagery, thinking of all the people I knew for whom images of death are not kitsch. How many triggers are stitched into the everyday world, headstones and hangings, ghosts everywhere. When you've lost someone you love, you don't need Halloween to tell you that ghosts are everywhere. What really got me that first year, as I wandered around the neighborhood with dear friends of Matt's who were trying their best to include me in the "fun" was the vast disconnect between this party-like atmosphere around all things death and after-life, and most peoples' real-life aversion to actual death. I knew, from first hand, visceral experience that any true discussion of death terrified most people. They might decorate their lawns with monsters and ghouls, hang skeletons from their trees, depict gruesome deaths on their sidewalks, but real death? No way. Halloween in this culture is lip service. As long as you don't mention actual death, as long as it isn't real, everything is alright. That first year especially, the hypocrisy of Halloween hit me hard. As I watched the neighborhood turn out in full costumed regalia, skeletons, ghosts, victims and assassins, I thought -- if you only knew. If you could look into my eyes and know this, feel what I feel, if you could live what I lived, your paper gowns of alleged terror would fall apart. Wandering the neighborhood that night, I wanted a button, pinned to my coat. A button that would invoke true terror, not the kind you can fold into a box to take out this time next year. 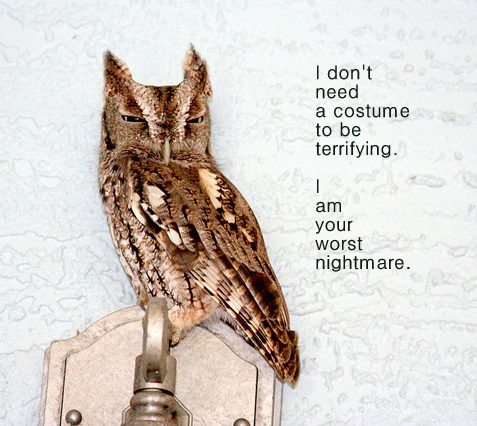 A very small button that read: I am your worst nightmare. No costume required. cc photo credit Richard Elzey. How about you? How does this bizarre season of death imagery intersect with your true life nightmare? How do you care for yourself when the imagery is everywhere? Megan Devine is a writer, grief advocate, and clinical counselor. Her partner drowned on a beautiful, ordinary, fine summer day, and she's stayed alive after that. Megan is the author of the audio program When Everything is Not Okay: Practical Tools to Help You Stay in Your Heart & Not Lose Your Mind. Roughly every six weeks or so, she hosts a 30-day online community of writers and grievers in the Writing Your Grief e-course; click on the link to join the next session. If you want to talk about your grief, you can even pick a time on her calendar for a free 30 minute phone call. Ongoing grief support is also available. Join the Refuge in Grief community on facebook, too.